Is there anything more American than a white t-shirt and blue jeans? This week, I'm celebrating the simplicity, ease and style of a good ole' t-shirt and jeans. They're the perfect palette for whatever accessory or shoe you've been wanting to wear, especially if you're not quite sure how to style them. Leopard heels? Statement necklace? Ankle boots? Tailored jacket? Pull out your favorite pair of jeans and a white t-shirt, and everything will work, I promise. White v-neck burnout t-shirt is made by Alternative Apparel, one of my favorite sources for soft, t-shirts and other knits. 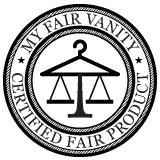 In addition to their 100% eco-friendly Alternative Earth line, Alternative Apparel aligns their manufacturing standards for all of their lines with the Fair Labor Association (FLA) Workplace Code of Conduct. 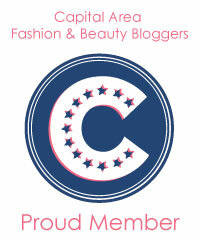 Additionally, many of their factories are Worldwide Responsible Apparel Production (WRAP) certified. Jeans are made in the USA by True Religion. Jacket is used, available on Ebay right now, but not for long. It's a women's medium, which would look great fitted or as an oversize option if you are smaller than a medium-- with flannel and satin lining, it's a steal. Bag is vegan with lining made of 100% recycled nylon by Matt and Nat. 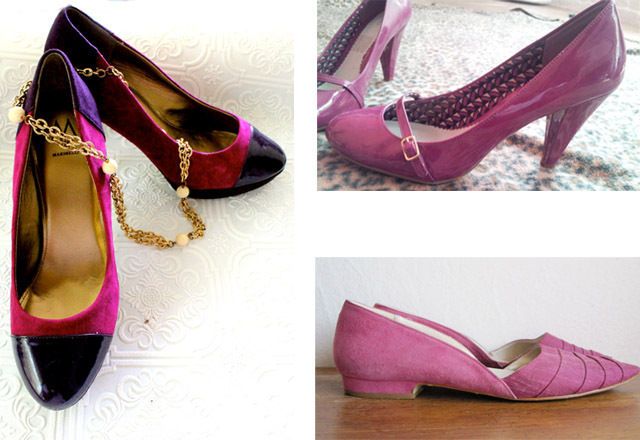 Shoes are vintage 1980s pumps (size 6), available on Etsy. I also snooped around Etsy to find vintage shoes in a variety of sizes to help you get this look. Below you'll see size 8 color-blocked heels, size 10 patent heels, and size 7.5 pointy flats. Oh that wonderful jacket inspires me to find my Barbour again! I love how you styled this look with fun purple shoes! Thanks so much, E, and thanks for stopping by! It's funny, my friend and I were thinking of doing a post solely dedicated to the magic of Barbour jackets and how they go with everything (almost). I have that jacket in black, and I am looking forward to completely copying your look when it's jacket weather finally. I love this entire look!